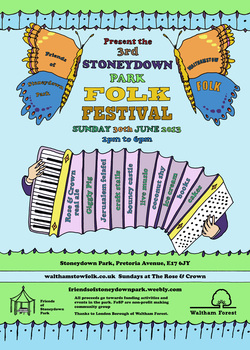 The Friends of Stoneydown Park are proud to announce that we will be working with Walthamstow folk Club to present the third annual Folk festival in the park on Sunday 30 June. In addition to a great line up of live musicians, there will be hot food from Giggly Pig and Jerusalem falafel, The Rose and Crown beer tent, local crafts, books, glitter tattoos, bouncy castle, coconut shy plus the Friends of Stoneydown home baked cake stall. It’s going to be another fun event for all to enjoy. See you there!